This year marks Lorenzo’s 70th vintage, 70 years since he started working with his father in the winery, and 60 years since they were able to buy their own vineyards. Admittedly, that is certainly an achievement worth some renown, and with his new found fame Lorenzo is sure to keep working his vines even when faced with the ever escalating values of his vineyards. During these 70 years little has changed, though there have been several milestones that are worth noting. The first occurred in 1974 when, following the dismal harvests of 1972 and 1973 Lorenzo begin green harvesting; which was revolutionary at the time. At roughly the same time he introduced steam cleaning in the cellar. The two actions combined to create a more concentrated and cleaner wine than was typically the case. Downright modernistic for the age! 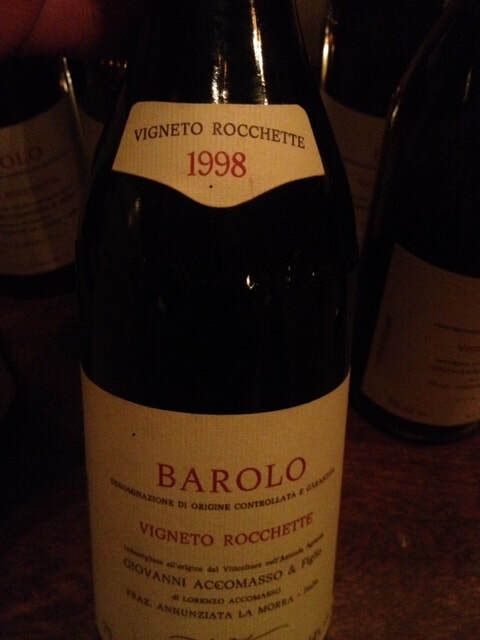 The wines of this era, roughly 1974- 1999 remain as a testament to his commitment during this period, and not in small part due to the elevage those wines underwent. As was often seen at that time, Lorenzo aged his wine first in botte, for 3 years, followed by an additional 3 years in 12.5 liter quarter brenta bottles, of which he had upwards of 300 at the time. This ageing in large format glass seems to freeze the wines, lending them a clarity and accentuating their crystalline nature in way that wood and small bottle ageing simply can not match. If you are fortunate to try wines from this period you may very well marvel at how well they are preserved and the clarity they continue to offer. Somewhere along the line, roughly at the turn of the millennium, Lorenzo did away with the demijohn ageing, according to him simply because he no longer enjoyed that phase of the work. Today the Barolo tend to spend roughly 3 years in wood, followed by 3 years in concrete, though the riservas are only bottled after 7 years, giving them an extra year in concrete. There are still a few demijohns bottled as well, overflow from the transfer between wood and concrete with no doubt a dash on sentimentality thrown in for good measure. Fermentations remain among the longest in the region, averaging between 50 and 60 days, though in no case less than 40 in a decent year, and no less than 35 in any event. In a good year total production of Barolo might be about 10,000 bottles, a drop in the ocean of Barolo, not to mention world class wines. The Barolo comes primarily from two parcels separated by some 500 meters: Rocche d’Annunziata, which enjoys a full southern exposure, and Rocchette facing a more easterly direction, with Lorenzo preferring the later, feeling that it has a more unique and identifiable personality due to the exposition which catches sun from 9am until the very latest rays of the setting sun. There are also vines planted in Annunziata just behind the winery and Accomasso home. Rocchette is planted with three varieties of Lampia and a little Michet which Lorenzo feels is good to have in moderation, as it requires more attention for a lower production with small clusters. One can recognize Rocchette as far way as Monforte due to the single oak tree Lorenzo left in the vineyard when he last replanted it in 2009. The Rochette and Rocche are generally bottled separately, though a straight Riserva has also been recently produced in 2008, 2009, and 2010. I love this story, and admire Lorenzo for what he has done. His wines are variable, and intriguing at the very least. They certainly standout as it’s a challenge to find traditional producers in La Morra, though it seems more are adopting the old ways each year. There is both variability and volatility to be found in these wines, but at the same time the Accomasso wines really do express something unique and have that trait rarely seen outside of Nebbiolo based wines: the ability to brush aside dirty aromas with air and blossom into something special. There have also been Dolcetto, Barbera, Nebbiolo and even a Vino Rosso produced here, though I have never actually seen a bottle of the Nebbiolo. The Dolcetto was last produced in 2010, while the Barbera Pochi Filagn - few vines in dialect - was recently available at the winery with the 2012 vintage being sold in 2018. Another anomaly in today’s world! In the years since my first visit to Lorenzo Accomasso’s cellar in the frazione of la Morra known as Annunziata there have been some changes, though little that one can see. The change, as it were, is more in the appreciation of these wines and the cult like status they have attained. That first visit we were able to pry a trunkful of cases from Lorenzo, all at favorable prices. Today things are different indeed. Barolo in know 55 euros a bottle and very hard to come by, though I can not lament the allocation that i have earned. What changed? It’s difficult to suss out, though I feel that i am at least minimally responsible, having made the introduction to the sommelier and wine taliban world that now covet these wines, perhaps beyond their relative value. Lorenzo was a pioneer of sorts in the Langhe, and remains a steadfast figure producing what he wants to produce, which is to say classic, traditional wines that express a time as much as a place. Out of 3 liter which had been opened two days before.